Thank you for registering for the Boo-Que 5k Run/Walk. Listed below is very important information for your upcoming run/walk. Please read completely and carefully. **Online registration will remain open up till Friday at 9pm. We will also be accepting registrations onsite race day. Pleased be advised that registering race morning is not advised as time, shirts and space is extremely limited. *packet pick up closes promptly at 10:45am. Give yourself plenty of time and arrive early. **You will be allowed to pick up Race Packets for friends and family. We ask that you please advise them you will be picking up their packet to avoid confusion. If you pre-registered and you cannot race or attend the race, you must pick up or arrange to have your shirt picked up during the scheduled Packet Pick-up hours. We will NOT hold or ship any unclaimed shirts. Parking is available in the South Inlet day use lot both Friday and Saturday. Delaware State Parks will NOT be charging runners for parking. 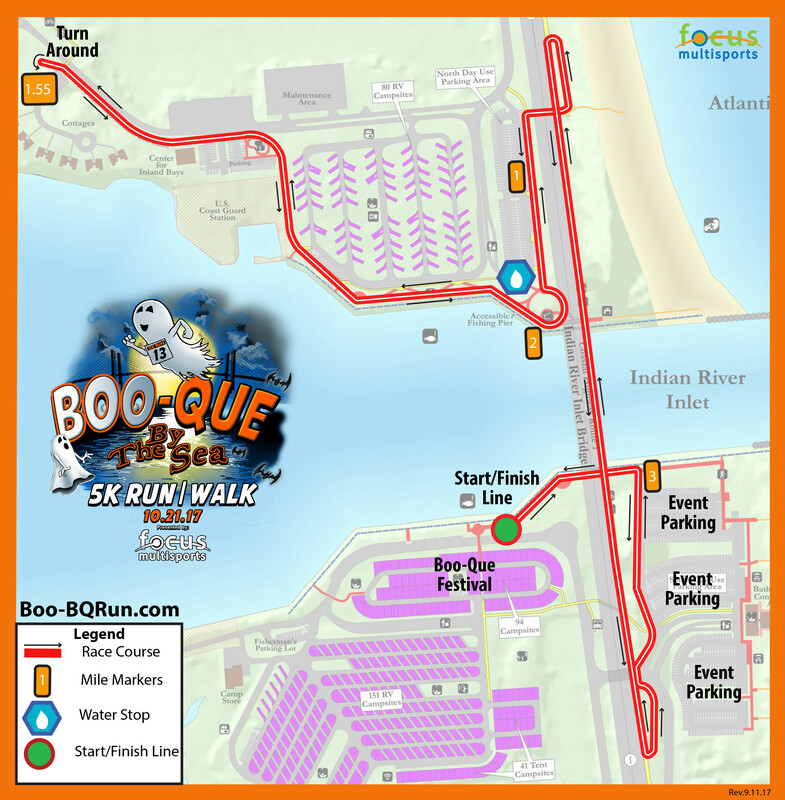 Please advise the attendant and the pay booth that you are a participant in the Boo-Que 5k Run/Walk. Please arrive early. We will be accepting onsite race registrations. We cannot guarantee shirts for race day registrations. *Awards must be picked up at presentation. Awards will not be shipped. Your bib must be display on the front of you. Your timing chip will be on your bib. Do not switch or change bibs with any other runners. This will affect the results! Do not remove your timing chip or bend it. Do not fold your bib. Do not cover you your bib with clothing during the race. VERY IMPORTANT! Please make sure you are wearing the bib that is registered to you. Wearing someone else bib creates major issues to the event and possibly the person wearing it. If race organizers become aware that a runner has participated in one of our events with a bib that is not registered to that runner, both the runner AND the person whom the bib is registered will be prohibited from participating in subsequent Focus Multisports events for a minimum of two years. No Dogs, Bikes, Scooters, Roller Blades, Skateboards, etc. Runners, Walkers and Inclusion participants Only. We ask that jogging please line up at the back of the starting corral. Please use caution at all times. No Refunds, Deferrals or Transfers. Real time results will be posted to the link below and at Result Kiosks near the finishing line. If you think there is an error with your result, please notify the timer located at the finish line timing table. Post Race Party with music, food and beverage will take place immediately following the race at the finishing line. *Food and Beverage is for event participants and volunteers only. Thank you! *You must be present to receive your award. We do NOT ship awards.